With four forlorn sweet potatoes staring at me from the pantry, I knew that our Pi Day had to include sweet potato pie. Of course, being from California, I'd never made sweet potato pie before. Heck, I'd never eaten sweet potato pie before. Thankfully, in this era of the internet, that was no problem at all, as a wonderful recipe was only a few clicks away. Makes: Filling for a 9" pie or 60+ mini pies. 1. We used this recipe for the crust and pressed it into mini muffin pans. The trick with this is keeping the crust thin so that you get a good balance of filling to crust. You could also use a rolled pie crust and use a cookie cutter to cut out circles and lay them into the pan like Bakerella does here. 2. I really enjoyed these. 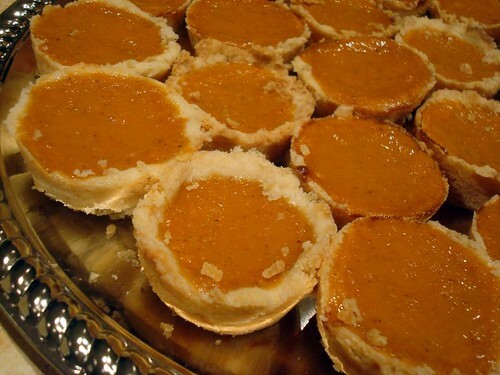 The flavor was a bit more mild than the pumpkin pies I grew up with but overall, very tasty.